Heute abend hab ich eine bonbonrosane Geburtstagskarte gebastelt. Sie ist wirklich ROSA*gggg. Aber sie ist auch für eine kleine Lady vorgesehen, die Rosa mag. Dann darf man auch mal bonbonfarben gestalten. Zudem ist die Karte nach dem aktuellen Papertake Weekly Challenge gestaltet. Tonight I have done a candyrose birthday card. It really is very rose*gggg. But well, the card is for a little lady who loves this colors. So it also may be candyrose from time to time. The sketch is from the actual Papertake Weekly Challenge. 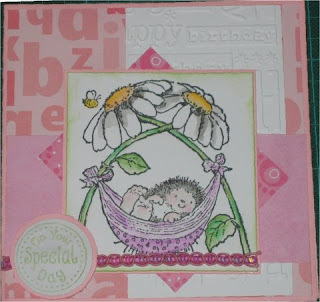 Cute card - the hedgie is great! Gorgeous card, lovely adorable image. Your card is absolutely pretty in pink. The hedgie is adorable. oh very nice card !! !